Most of the summer I’ve ridden Zelda bitless — mostly using the Flower Hackamore. Since the end of June, inspired by Anna Blake’s post on riding bitless, Zelda and I took it on a challenge. I’ve tried both the Flower Hackamore and a Nutural Bitless bridle. I also tried a leather bit that attaches under the chin, with no headstall. That was a complete bust. She spit that bit out with gusto and I was left with a set of reins attached to . . . nothing! She is quite clear that she likes the Flower Hackamore the best. It has been years since I’d ridden bitless on a daily basis and it reminded me why it’s an important exercise. Not, as you might guess, because I think bits are inherently terrible. If you have light, steady hands and the bit fits your horse’s mouth well, I don’t think there’s anything wrong with using one. In fact, the communication you have with a bit is very subtle. Nope, riding bitless is good for the rider because it shows you where the holes are in your technique! Here are my reasons for why you should try riding bitless. Bitless bridles make you realize how much you ride with your hands. Remember that I just said that bits give you very subtle communication? The opposite is true with a bitless set up. And that’s often a good thing, because as humans we are noisy with our hands. We move them, we jiggle the bit, we want to fix everything with them. Remove that noise and the silence is deafening. Your horse will be happy when you leave her mouth alone (when I switched my Trakehner to bitless many years ago, he immediately started to jump so much better! It was sobering to realize that I had been picking at his face on the way to every jump). In fact, you might think she’s not listening at all. Persist, even if she ignores you for a time, because you will find new ways to talk to each other. Riding bitless makes you ride with your seat. As soon as your horse starts listening to you, new conversations emerge. Your horse becomes more attuned to the way you use your seat, how you shift your weight, whether you control your speed by half halting with your thighs. Suddenly your hands aren’t so important. It’s much easier for your horse to snack. With so much lush grass around, Zelda is very grateful to not have a bit in her mouth. Although she is not allowed to eat during our rides, she certainly takes advantage of this as soon as we’re done. There’s no bit to clean. And in the winter, there’s no bit to warm. There’s an appealing simplicity to riding bitless. It is a good thing when your horse has a bit of foam around her lips. This is a result of the horse having a relaxed jaw. 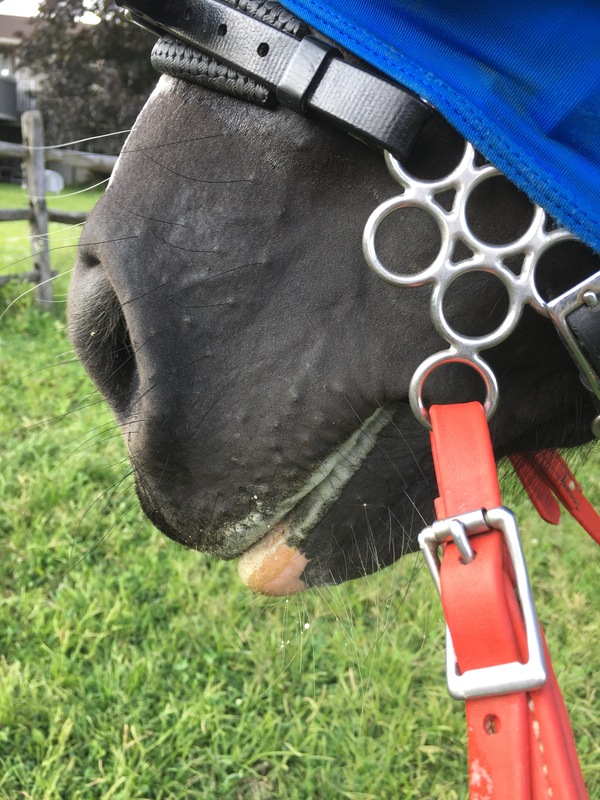 Although this is often associated with bitted riding, all of my horses produce a small amount of foam around closed lips when ridden bitless. I’ve taken Zelda out on the trails and also schooled her in the ring. She goes just as well now in a bitless bridle as she does in her bitted one (although I’m not sure I’d take her hunting bitless). The Zilco Flower Hackamore uses the placement of the rings to apply some leverage/pressure both on the chin groove and very slightly on the poll. Unlike the Nurtural bridle, which uses a cross under design, you use a direct aid very similar to a bitted bridle. I’ll write more about the Nurtural Bridle later, but since Zelda had a clear preference for this one. One safety precaution. When you first try riding bitless it’s a good idea to start in an enclosed arena. I was very glad I did that with the leather bit because once Zelda spit it out, I had no control. 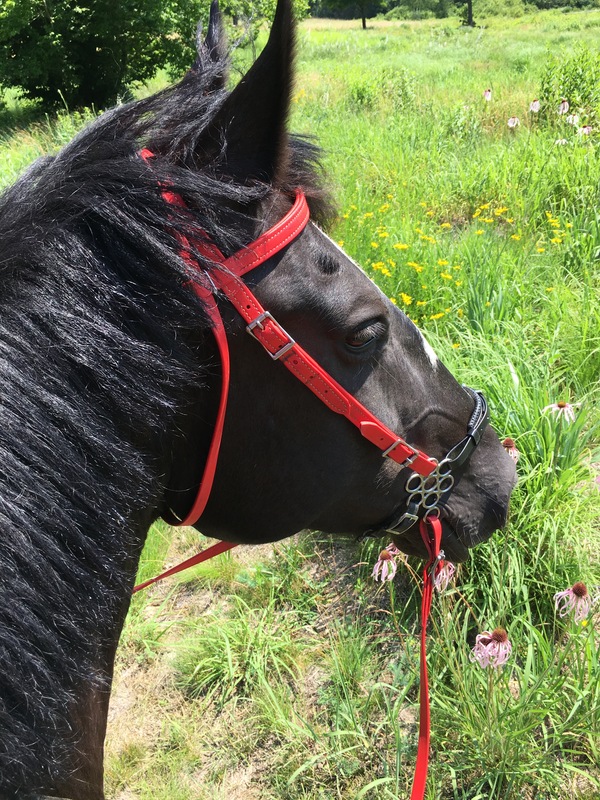 With the bitless bridles, I never felt out of control but it did take a few rides before Zelda was listening in the same way she does with a bit. It’s not for every horse & rider combo. My TB is not a super candidate for riding bitless. He’s okay but not great. I still ride him bitless sometimes to give him a break but it’s never something he’s taken to. On the other hand, I had a Trakehener who had a small mouth and a thick tongue. I never found a bit that was comfortable for him. The day I tried him bitless (a variation on the flower hack) he gave a huge sigh of relief. I hunted him first flight for years and he was always responsive in his bitless bridle. As I mentioned in the post, I realized that I was inadvertently fussing with him as we came at xc jumps. The bitless bridle prevented me from doing that. My experience with him made me decide that periodically I should cycle through my bitting options with all my horses.